A very unique slot to say the least, it’s Crystal Crush! We bet you a million pounds that you’ve never played an online slot quite like this one! 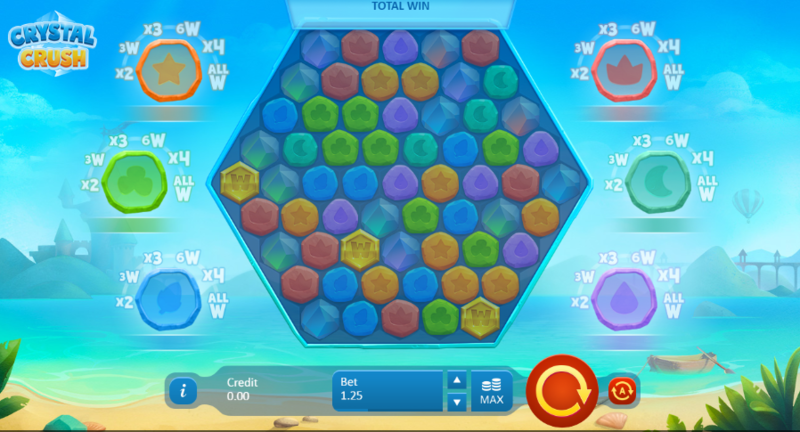 Crystal Crush from Playson is a very interesting online slot to say the least, one that requires a certain level of skill to master compared to some of the other offerings from the developer. In this slot you are going to have to cluster together wins, rather than match them in a straight line. The layout of this one is very much like a honeycomb, which can be a little difficult to adhere too at first, but after a few spins, this shouldn’t prove to be that much of an issue! If you are looking for more info on this one, then why not check out the rest of our review below! Or if you want to explore Easy Slots, click here. Multiplier: If you can string together wins often enough, you’ll find that an additional multiplier will be added to your spin, this will increase your scores tenfold, perfect for those chasing the high scores and high payouts. Wilds: Like traditional wilds, these will substitute symbols for simply matching them in one fell swoop. Wilds are useful in shaking up your game a little, adding new symbols that you can match within the hexagon. Wilds come with quite a high score also, making them the most all-around symbol to match. Browse the Easy Slots promotions page for more bonus features to help you get the most out of your gameplay! Crystal Crush is a very fun slot to behold, one that serves as the perfect alternative to some of the other slots out there right now which use a very similar template. Cluster slots will always appear interesting to us just because of how unique they are overall, not to mention the financial implications that comes with every spin you partake in! Find out more games like Crystal Crush on Easy.